Researchers have demonstrated a new way to sequence proteins that is much more sensitive than existing technology, identifying individual protein molecules rather than requiring millions of molecules at a time. The advance could have a major impact in biomedical research, making it easier to reveal new biomarkers for the diagnosis of cancer and other diseases, as well as enhance our understanding of how healthy cells function. Work on this project began more than six years ago when Marcotte and colleagues first envisioned adapting the methods of next generation gene sequencing to protein sequencing. 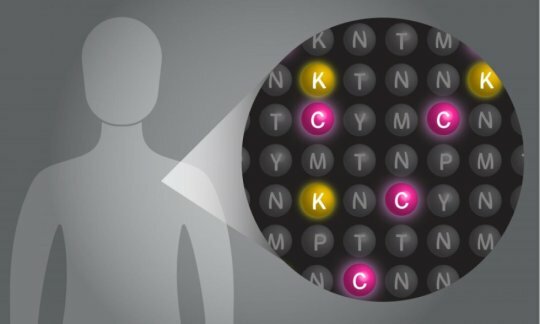 Next generation gene sequencing is a set of techniques that have made sequencing the entire genome of any living organism fast, accurate and affordable, accelerating biological research -- and for the rest of us, enabling at-home genetic testing for ancestry and disease. In the same way that these earlier advances provided quick and comprehensive information about thousands of genes that influence human health, the new technology provides for rapid and comprehensive information about tens of thousands of proteins that play a role in healthy functioning or in diseases. In many disorders -- such as cancer, Alzheimer's, heart failure and diabetes -- cells produce proteins and other substances that act as unique biomarkers, akin to fingerprints. Better detection of these biomarkers would help researchers understand the causes of disorders or provide earlier, more accurate diagnoses for patients. The current laboratory standard for sequencing proteins, using a tool called mass spectrometry, is not sensitive for many applications -- it can detect a protein only if there are about a million copies of it. It also has a "low throughput," meaning it can detect only a few thousand distinct protein types in a single sample.